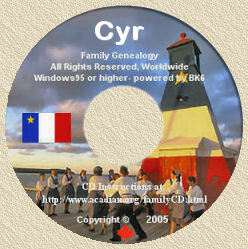 Acadian Genealogy Homepage; Reviews of Acadian-Cajun Genealogy CD-ROMs! Independent Reviews and Evaluations of the "In Search of Our Acadian Roots" and "Acadian-Cajun Family Trees" CD-ROM's. There have been numerous "independent" (and unsolicited) reviews/evaluations relative the "In Search of Our Acadian Roots" and "Aacadian-Cajun Family Trees" CD's, which have been published in various genealogical publications. If you, or someone you know, has published similar "reviews/evaluations" on the Acadian CD's, I would greatly appreciate receiving a copy, which I will be pleased to post on my web site. "Acadian-Cajun Family..." Very comprehensive review by Rick Roberts of Global Genealogy Supply.